Thanks to Garry Ogston, Gemma Bauld and Grace McNicholas for writing the summaries! The largetooth sawfish (Pristis pristis) can be found across the globe, and consists of four separate sub populations; the Western Atlantic, Eastern Atlantic, Eastern Pacific, and Indo-West Pacific (including northern Australia – spanning the Kimberley to Cape York Peninsula). The species was once considered common across many of these sub populations but has unfortunately undergone drastic population reductions. The largetooth sawfishis now thought to be locally extinct in many regions, and as such is listed as Critically Endangered under the IUCN Red List. 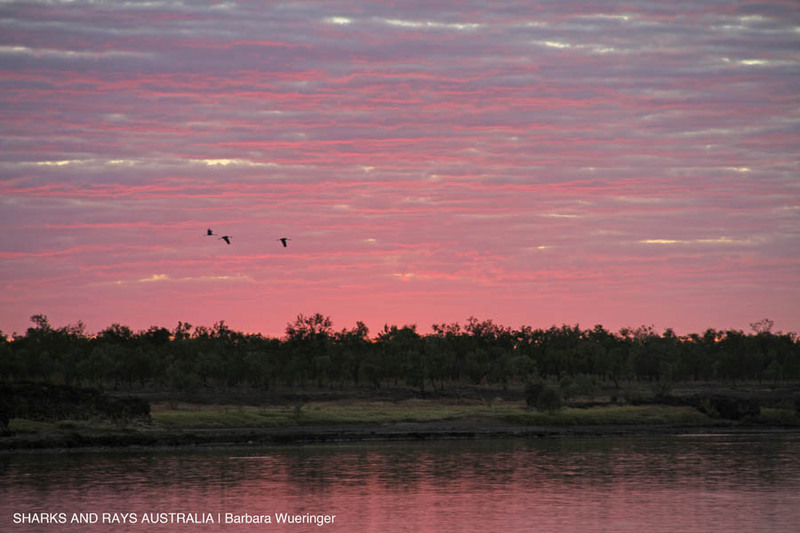 The Kimberley region in north-western Australia represents one of the last intact nurseries for the largetooth sawfish, however even within Australia the species is threatened and listed as Vulnerable under Australia’s EPBC Act. The species is biologically fascinating, both in appearance, due to its large rostrum (averaging between 17 and 24 teeth per side) which is used for predation and defence, and also in its ability to tolerate a wide range of salinities (euryhaline). The largetooth sawfish will spend the first three to four years of its life within freshwater systems growing to a length of approximately 3-4m, before then migrating into the estuarine and marine environments where they reach over 6m in length as an adult. 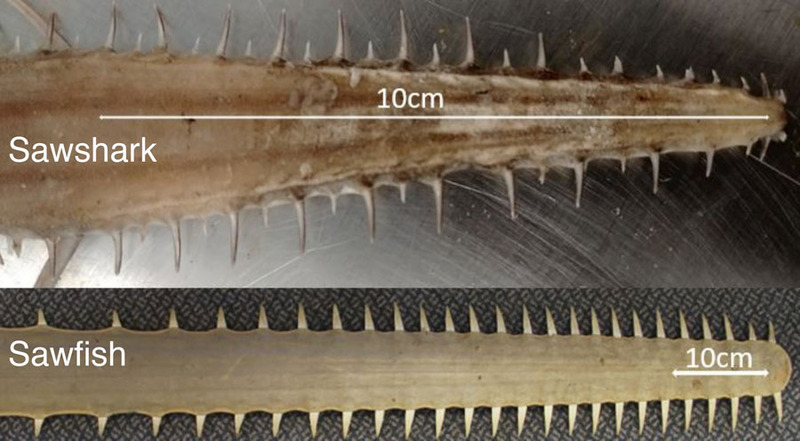 Within the freshwater systems, the diet of the largetooth sawfish consists primarily of species found in the lower water column or benthic environment, such as the blue-catfish (Neoarius graeffei), and detritus. Did you know? Largetooth sawfish are ovoviviparous; meaning the young develop inside an egg case but remain within the body of the mother until they are ready to hatch, before then being born as live young! Did you know? Unlike bony fish, sawfish have no swim bladders and instead rely on large oil-filled livers to help with buoyancy! The Dwarf sawfish (Pristis clavata) is a species of sawfish that can reach at least 318cm in length. It is greenish-brown above and white underneath with gill opening on its underside. Like other sawfish species it has a toothed rostrum. 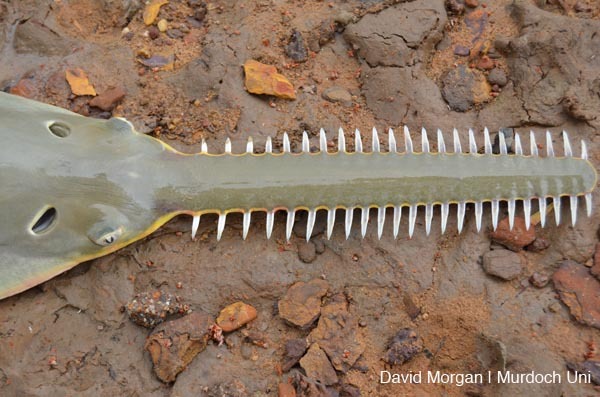 The Dwarf sawfish is found within sand and mud flats associated with close proximity to mangroves in shallow coastal and estuarine waters of northern Australia in the Northern Territory, Queensland and Western Australia. Dwarf sawfish are viviparous (giving birth to live young), with litter sizes unknown but are assumed to be similar to other Pristisspecies with an average of approximately seven pups per litter. Juveniles are estimated to be between 60‑81cm at the time of birth, and males of the species reaching maturity at eight years old, being approximately 255‑260cm. It is estimated that the Dwarf sawfish have longevity of up to 34 years. Dwarf sawfish in Western Australian waters have been found to occupy restricted areas of habitat. They move up to 10km during each tide cycle, staying within inundated mangrove forests during high tide and moving out a few kilometres on the low tide. Individuals were found to return to within 100m of their previous high tide resting sites demonstrating repeated use of habitat. They frequently occupy habitats less than 2m deep. Current major threats to the Dwarf sawfish include getting their toothed rostrums stuck in fishing nets in shallow waters in which they inhabit. Historically their rostrums were also collected and traded. However, from 2009, this species was protected from all commercial and recreational use and trade in Australia. The Dwarf sawfish is currently listed as endangered on the IUCN Red List. The Green sawfish (Pristis zijsron) is a species that can grow to between five and seven metres in length and is possibly one of the largest sawfish. They are greenish-brown or olive above and pale to white underneath, with gill openings on its underside. Like other sawfish species it has a flattened head and an elongated snout with uneven-spaced teeth along each side. This is commonly called the rostrum. The Green sawfish in Australia used to be found as far south as Sydney, however its range is now limited to northern Australia (Queensland, Northern Territory and Western Australia). The Green sawfish is also found in the Indo-West Pacific from southern Africa to the Red Sea, Persian Gulf, southern Asia, Indo-Australian archipelago, east Asia and as far north as Taiwan and southern China. They generally inhabit shallow water in coastal and estuarine areas in close proximity to mangrove shorelines. Green sawfish are viviparous (giving birth to live young), with litters being approximately 12 pups. Juveniles are estimated to be approximately 76 cm at the time of birth, and reaching 340–380 cm at maturity at nine years of age. A maximum age for this species is greater than 50 years. 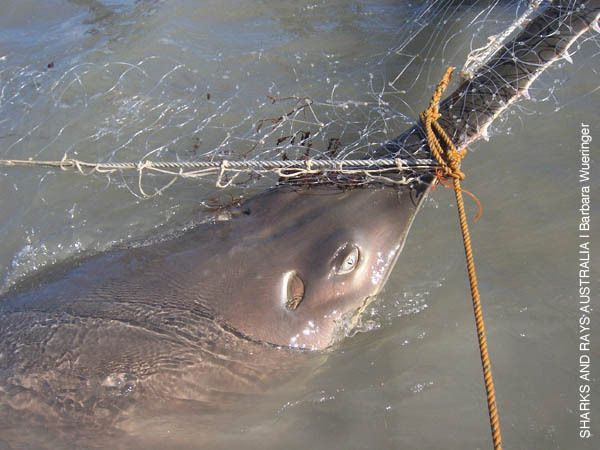 Current major threats to the Green sawfish include getting their toothed rostrums stuck in fishing nets in shallow waters in which they inhabit. Historically their rostrums, fins and meat were also collected and traded locally and internationally, however, this species is now protected from all commercial and recreational use and trade, although difficult to enforce in some countries. The Green sawfish is currently listed as critically endangered on the IUCN Red List. The bullshark (Carcharhinus leucas) is found in warm temperate and tropical waters around the globe, including countries such as Australia, India, Ecuador and the United States of America. The species is listed as Near-Threatened under the IUCN Red List and faces several threats including recreational and commercial fisheries with commercial fisheries globally being driven by the demand for shark fins, liver oil and meat, however it is also regularly caught as by-catch. The species is also threatened by habitat modification, particularly of nursery grounds e.g. estuarine and freshwater systems. Within Australia the bullshark is not protected and is able to be caught for both recreational and commercial fisheries. Several regions of Australia however, have imposed size limits to reduce the threat of overfishing mature specimens. Although common in marine and estuarine waters, it is only one of a few species of shark that can tolerate long periods in freshwater (e.g. also see river sharks Glyphis spp. ), allowing it to penetrate large distances upstream. Pregnant females migrate to the estuarine, freshwater regions to give birth, with the juveniles utilising these areas as nursery grounds. When born, the bull sharks measure between 0.5m and 0.8m, before maturing at approximately 1.5-2.2m for males and 1.8-2.3m for females. A full grown adult bull shark can reach over 3m in length. As the bull shark matures it also diversifies its diet, consuming a range of prey species from turtles to birds, teleost fishes and elasmobranchs, and even crustaceans. Did you know? Bull sharks are not always at the top of the food chain and get predated on by other bull sharks, Orca’s, and even crocodiles! The Winghead Shark (Eusphyra blochii) is found around the Indo-West Pacific continental shelf. Found in shallow coastal waters, wingheads feed on/near the bottom, with a diet consisting of crustaceans, cephalopods and small fish. Growing to a maximum total length of just 186 cm, they are smallest of all hammerhead species. Being the smallest species, their characteristic elongated head or ‘cephalofoil’ also has the highest width to body length ratio of all hammerheads. It can reach nearly 50% of their total body length. Males and females reach maturity at around 108 cm and 120 cm respectively, and both sexes have a distinct seasonal reproductive cycle, breeding once a year. Females give birth to live young in February/March in litters of 6 – 25 pups, with new-borns measuring approximately 45 cm. Unfortunately, winghead sharks are impacted by coastal gillnet fisheries, as their slender elongated heads are easily caught in a range of gillnet mesh sizes. They have also been heavily exploited for their fins and meat. Over the last three generations it is estimated the global population has declined by at least 50%. These declines are most pronounced in areas with intense coastal fishing such as Indonesia and other Asian countries, where reports of wingheads in landing surveys have become less and less common. As a result, Eusphyra blochii are now listed as globally Endangered on the IUCN Red List. However, in Australia, winghead populations are still thought to be relatively healthy due to much lower bycatch levels in the better managed Australian gillnet and trawl fisheries. Although the Australian population is currently only listed as Least Concern, they may still be at risk due to their patchy distribution. Chin, A, et al. (2017). 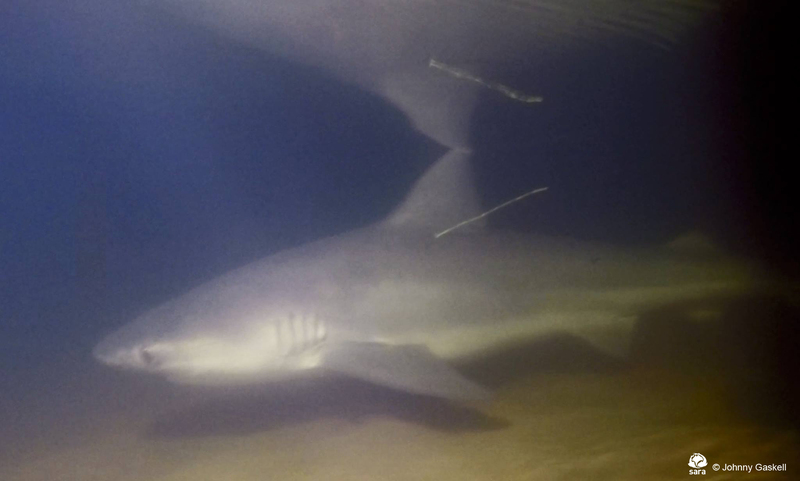 Crossing lines: a multidisciplinary framework for assessing connectivity of hammerhead sharks across jurisdictional boundaries. Nature Publishing Group, (April), Nature Publishing Group., pp.1–14. [Online] Available at: doi:10.1038/srep46061. Compagno, LJ. (1984). FAO species catalogue. Vol. 4. Sharks of the world. An annotated and illustrated catalogue of shark species known to date. FAO Fisheries Synopsis No. 125, Volume 4, Part 1. Smart, JJ.and Simpfendorfer, CA. (2016). Eusphyra blochii. The IUCN Red List of Threatened Species. [Online]. Available at: doi:org/10.2305/IUCN.UK.2016- 1.RLTS.T41810A68623209.en. Stevens, JD and Lyle, JM. (1989). 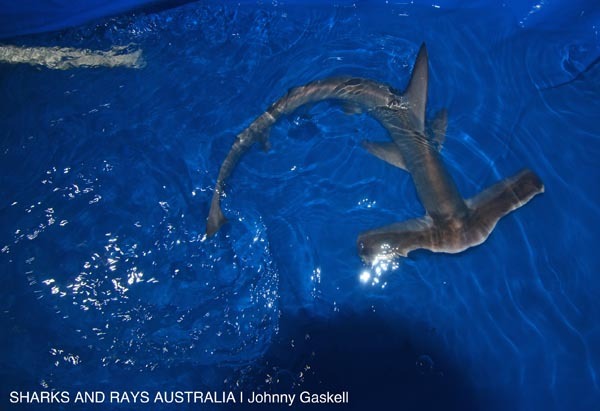 Biology of three hammerhead sharks (Eusphyra blochii, Sphyrna mokarran and S. lewini) from Northern Australia. Marine and Freshwater Research, 40, pp.129–146. [Online]. Available at: doi:10.1071/MF9890129. The ocean is filled with so many incredible creatures, incredible and bizarre. Many of these fish have evolved under similar pressures which have led them to look quite similar even if they are genetically quite distinct. This similarity in appearance or development of similar structures is what is known as homology. One great example for this can be seen in sawfish and sawsharks! Now many of you may be saying, wait, aren’t those the same thing? The answer is no! While these two groups of fish are very similar in appearance, they actually have quite a few big differences that can make it easy to tell them apart once you know them! The differences we will cover today are their ‘saws’, general body size and the gills. The ‘saws’ or elongated toothed rostra are the features that make these fish really quite unique. The saw is thought to be used for predation and defense in both groups. However, the actual structure of the saw is really quite different! Sawfish saws are lined with a number of teeth along both sides of their saw that vary in size and number by species but each one of these teeth are permanent! Meaning that if they happen to lose one it will never grow back. The rostral teeth of sawfish also grow from their base, like a rodent’s tooth, so that the animals can sharpen them regularly in the sand. Sawsharks on the other hand have a very different saw. Teeth can be found along both sides of the saw like in sawfish, however, sawshark teeth are replaceable! The most distinguishable feature to separate a sawfish and a sawshark saw is the presence of what are called ‘barbels’. 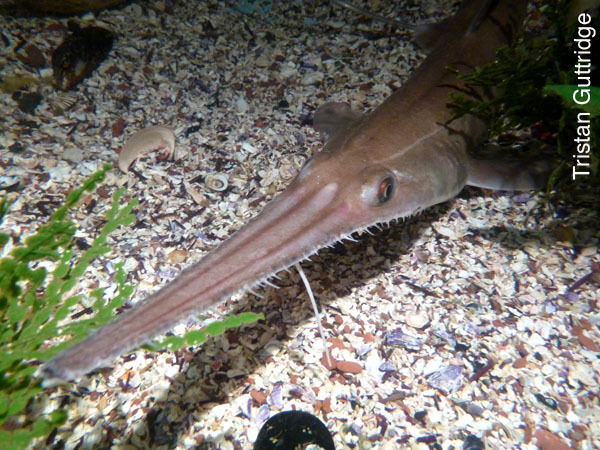 Barbels are found only on sawshark saws and they look like a little moustache coming off the saw. This moustache is thought to have a tactile function, meaning they use them to feel around in the sand for food. The size of fish is an easy indicator of species between these groups. Sawfish are very large fish, some reaching over 7 meters in length! While sawsharks are much smaller, averaging around 1 meter for an adult depending on species. In addition to size, it is important to know that sawfish are technically rays while sawsharks are true sharks. What that means is that in sawfish you will find their gills located on the underside of the fish. Where as in sharks they are located on the side of the head. These fish could be considered ‘cousins’ in a way since they are both chondrichthyans, meaning they both have a skeleton made out of cartilage instead of bone. However, it is important to remember that sawfish are actually rays while sawsharks are true sharks. Sawfish may not follow the typical body plan of their relatives the stingrays, but they are more closely related to them than they are to sawsharks! A sawshark, Pristiophorus nudipinnis resting on the substrate. See the barbels? Image by Tristan Guttridge. 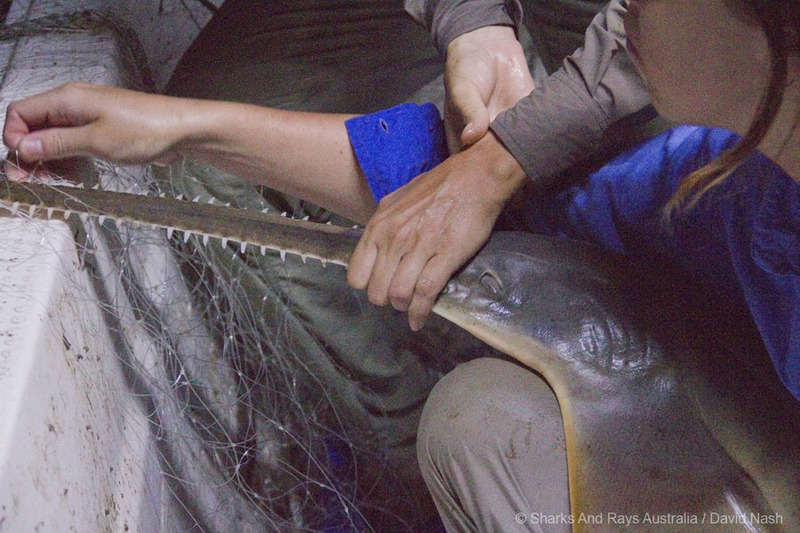 A freshwater sawfish, Pristis pristis, is disentangled from a gill net in order to be tagged and released. Its teeth are evenly sized and spaced, contrary to those of sawsharks. Image by Dave Nash. 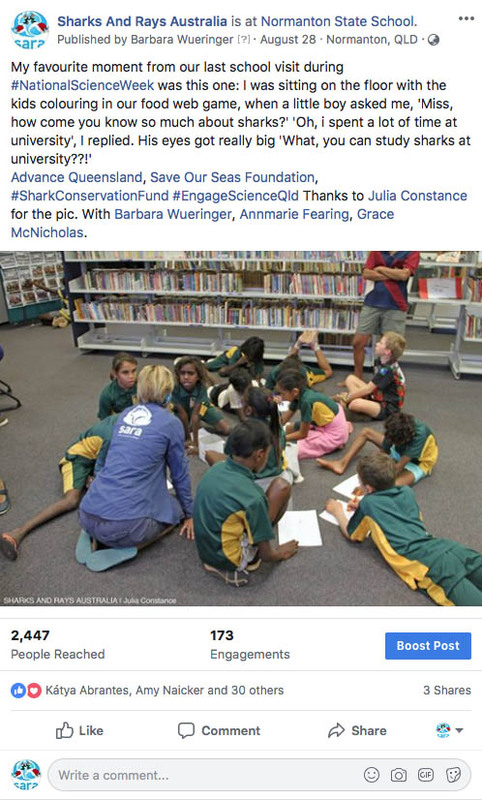 SARA was founded with the goal to contribute to elasmobranch science in Queensland and Australia, while also working with people from all walks of life. Documenting the status quo through data collection is an important duty of science. But the people that we meet in the field, who ultimately decide whether they release an accidentally captured sawfish alive, don’t read scientific papers. SARA is a group effort and we could not do without the volunteer Field Assistants who join us. I hope that you all realize that without you, there would be hardly any sawfish research happening in Queensland. Not just because lack of people power, but also because there is simply no government funded sawfish fieldwork happening in Queensland yet (or during the last 9 years, for that matter). This is a sad situation for these EPBC Act listed species, which are slowly falling through the cracks here. This is what we are changing, together with all the people who join us. No pressure no diamonds. Our philosophy at SARA is that if we do not involve locals, then conservation won’t stand a chance in the long term. And excitedly, our work with Indigenous Ranger groups is expanding. In early 2018 I had the pleasure, for a joint project with the University of Queensland, funded by Rio Tinto Aluminium, to introduce all of the Mapoon Land and Sea Rangers to sawfish research. After a day of inductions, we spent close to a week sampling for sawfish. We did not catch a sawfish, but the community involvement that this expedition has created, assures me that sawfish are in good hands in this region. 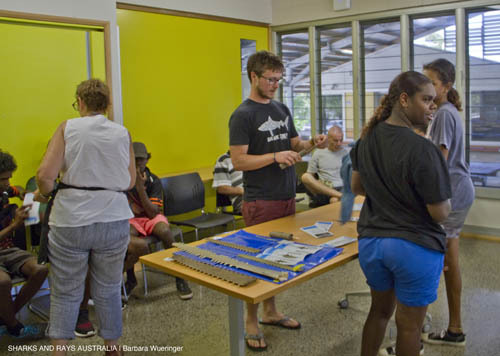 A community forum was held and many people told me that they had no idea how endangered sawfish were. When I returned to Old Mapoon later that year, some locals told me that they now release sawfish alive if they catch one. Later on in the year, the dedication of these Indigenous rangers enabled our collaborators from UQ to tag four juvenile green sawfish near Mapoon. The Kowanyama Land and Sea Rangers joined us in the field again this year, and helped us tag and release a juvenile bull shark. The expedition was a dream come true, and also some of the hardest fieldwork I have ever done. After several days of sampling (=getting up at 2 in the morning, sampling, nap, and sampling again until late at night), and several tags detaching early, we ended up actively tracking a juvenile sawfish for 30 hr, followed by 11 hrs of sleep. Happy sleep, I may add. You can read more about this expedition here. Next year we will run the first joint expedition with the Laura Land and Sea Rangers, who have been very keen to work with us since 2016. Their country is nothing short of spectacular, and probably contains the highest density of sawfish rock artin Australia, which may even be a reflection of historic abundances?! How much these hard working rangers care about sawfish is already visible in their detailed submissions, where TO’s (Traditional Owners of the Land) make sure they note things like the shape of the caudal fin as well as the teeth of a sawfish before releasing it safely. After years of personally working with a handful of commercial fishers, this part of our work is now expanding as well. The larger connection got kicked off in 2016, when I gave a talk at the annual meeting of the Gulf Fisher Associationin Karumba. 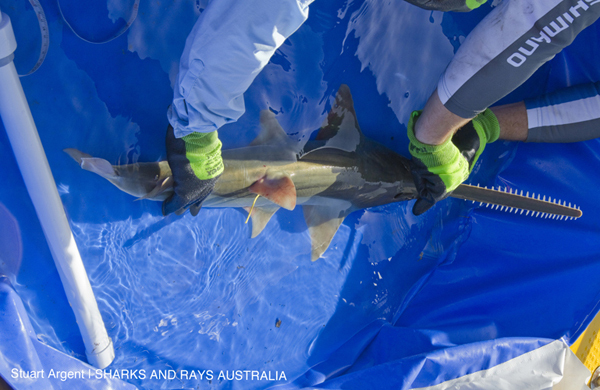 With the aid of a grant from the Shark Conservation Fund we are currently testing different sawfish release methods. These include a hand tool that a small group of fishers is using and that could make all the difference. Next year, we will be holding several sawfish release workshops, with the aim to find out which methods work best for the different fishers, with the aim of making these methods available to all of them. Currently there are 3 workshops planned for 2019, but this number might increase. There are loud voices in the conservation sector wanting to phase out gill net fisheries in Queensland. The WWF for example, has bought fishing licences from commercial fishers and laid them dormant. While the replacement of destructive methods with less harmful methods needs to continue globally, we also need to find ways of making gillnet fisheries less harmful for as long as they continue. As a first world nation, Australia has a responsibility in this. Shutting down our own fisheries means exporting our problems, and importing fish from developing nations, where gillnets are still the predominant fishing gear, simply cannot be the solution. When considering buying back licences and thus shutting down gill net fisheries in the Gulf of Carpentaria, it is also important to consider what effect this could have. The whole of Queensland’s coast of the Gulf of Carpentaria, which measures around 1200 km is currently patrolled by four Fisheries Officers from QDAF. If the existing fisheries within this area were shut down, it would be an open invitation for illegal fishing, which cannot be regulated or even assessed with the current methods/budget. In 2018 we finally received the first ever support from the Queensland Government, through an Engaging Science Grant. This funding allowed us to create a sawfish event at the Cairns Museum, finalize our Food Web Game and talk to around 260 school kids in Far North Queensland and the Cape York Region, including during National Science Week. Now, this number appears vanishingly small compared to what our collaborators from Sharks4Kids are doing (We love their work and that they joined us on our school tour! ), but most of the kids we spoke with, and played our food web game with, were Indigenous and had seen a sawfish in the wild, which is super exciting. 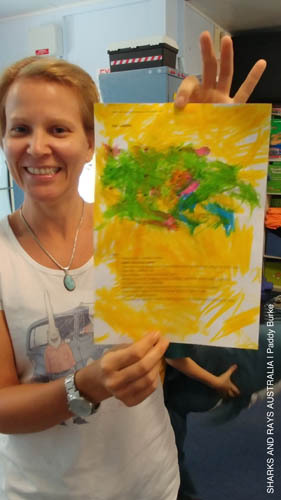 The Normanton State School was so inspired that their kids will do a project on the life cycle of freshwater sawfish next term. We cannot wait to see the results! You can read more about the school visits here. With all the data collection going on at SARA, data analysis and publication is becoming an important topic. Mid 2018 we were lucky enough to welcome Grace McNicholas, a MSc student from the University of York in Cairns. Grace spent a great deal of time working on our database and analysing some of our data, and even joined us in the field. She has since returned home and is working on the first paper to come out of our field data. In late 2018 we also welcomed Jess Hudgins, a MSc/PhD candidate from Heriot-Watt University from Scotland, who is trying to get a grip on historic and current sawfish distributions in Queensland and maybe even Australia. As her project is kicking off, you can find her on the SARA Facebook page through her #ThrowbackThursday posts on historic sawfish captures. Her data analysis already sheds light on the historic perceptions of these animals, which likely contributed to their decline. In August 2018, we also welcomed Annmarie Fearing, a MSc student from the lab of Dr Nicole Phillips from the University of Mississippi in Cairns. An event in the Cairns Museum during National Science Week kicked off SARA’s involvement in the collection of historic DNA from sawfish rostra. Annmarie’s analysis if these DNA samples will shed light on when sawfish populations decreased in genetic diversity globally. You can read their latest project updates here. We are now doing eDNA! 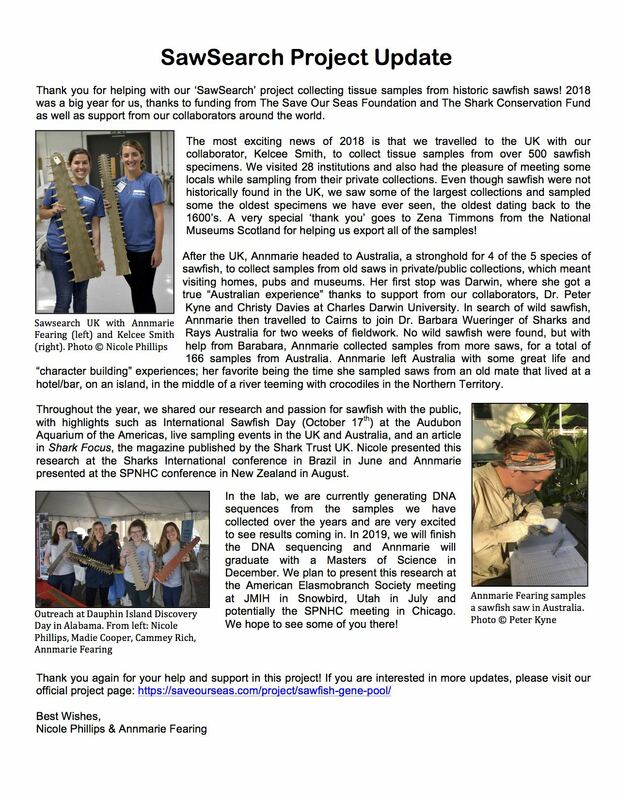 In 2018, we finally commenced our collaboration with Madie Cooper and Colin Simpfendorfer from JCU Townsville, to collect environmental DNA of sawfish. Every organism swimming in water can be detected through the DNA it gives off. This method is in its infancy, but it can only get more detailed and so we are very excited to be helping with sample collection. In Queensland, sawfish are protected under the Fisheries Act of 1994, which also makes the possession of sawfish body parts without a permit illegal. Because of this, some people decided to donate not only DNA samples but whole saws to us. In 2019 SARA will start an initiative that will see these saws being lent to other institutions (tourist info centres, local museums, etc), without the need for them to get a permit. 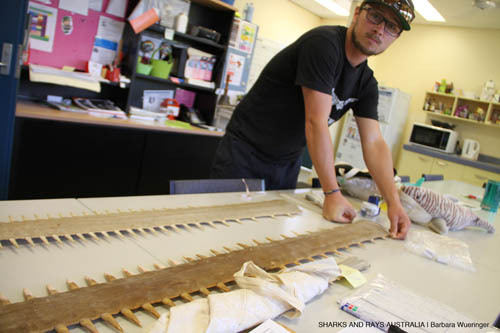 We intend to create displays with the saws informing people of the status of sawfish and where to report them. If you have any experience in creating something like this or know how we could fund it, please get in touch! Lastly we would like to thank Julia Constance, who is now looking after our Instagram. She is doing an awesome job and we could not do without her! 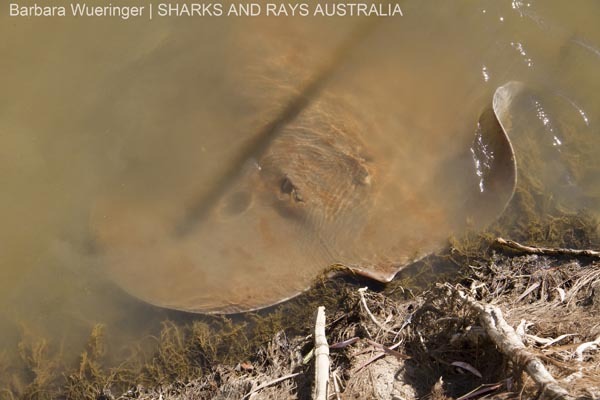 In order to run our fieldwork, and maintain our presence in the field, which appears to make a large difference for sawfish in Queensland, we require Volunteer Field Assistants to join us. Currently the numbers of people joining us are small, which is likely due to us not reaching enough people. If you have ideas for how we can reach more people, get in touch! If you are aware of groups where we can post about our expedition openings or if you can think of other ways of reaching the right people, please let us know. Every single person makes a difference. I would also like to thank our research supporters, including the Save Our Seas Foundation, the Shark Conservation Fund and starting in 2019, Seaworld Australia. Our local supporters in Cairns are also very important to us, as we know that our car, boat and trailer are in good hands. Thank you Aussie Marine, Warpac Trailers and KW Auto!! Our stable isotope project is slowly moving forward, and the first samples have been analysed. The project still requires a dedicated student for it! We have heaps of other projects listed online, go check them out! In 2019 we will be expanding our work to the east coast of Queensland (permit pending). As sawfish populations have never been assessed in the Great Barrier Reef Marine Park, this work surely is important. 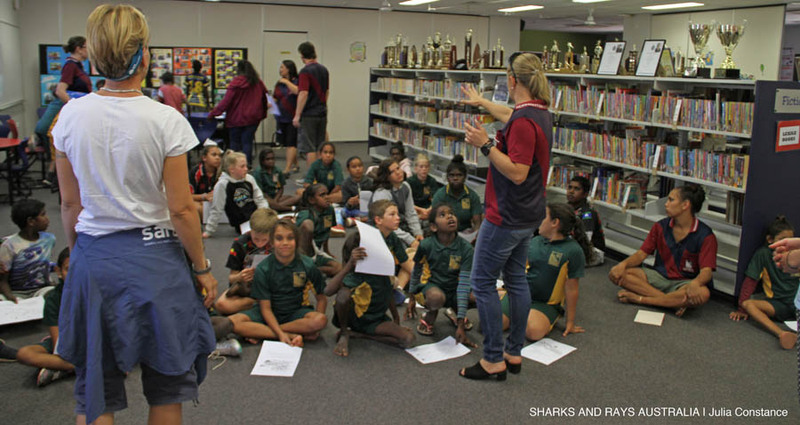 In early November 2018, Sharks4Kids and Sharks And Rays Australia embarked on a joint mission to visit schools around Far North Queensland to talk to the kids about sawfish. Throughout the year, we had finalised developing our ‘North Australian Food Web Game’ and as part of fieldtrips we had already visited the Kowanyama, Old Mapoon and Normanton State Schools. The visits to Kowanyama and Old Mapoon were our second time in these schools, and some of the kids remembered us and how to tag fish, which is fantastic news. The aim of the school visits is to introduce our work, and the importance of sharks and rays in the local ecosystems, to the kids. We often visit state schools and aim for schools that are off the beaten track. The local Indigenous children often spend time ‘on country’ with their families, often hunting and fishing. Some of their parents work for the local Indigenous ranger groups. But sometimes these parts of their lives are separated from what they learn in school, and so we aim to connect what they see in their free time with ‘boring science’. I am proud to stand in front of all these little girls and boys as a female scientist. Fieldwork oriented elasmobranch science is clearly a male dominated field, and so every woman in this field is also a #WomenInSTEM ambassador for #GirlsInSTEM. This year, I had 11 other biologists join me on the school visits, and each one of them brought in their own perspectives and knowledge. 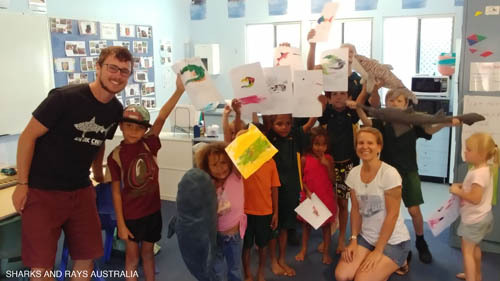 For the last visits in November, Paddy Burke, who is currently doing his PhD at Macquarie University, joined me as the representative of Sharks4Kids. Over the duration of one week, we visited schools in Cooktown, Laura, Wonga Beach and Kuranda. Sadly, the Hopevale and Yarrabah state schools did not have time for us. The children that we met were between 4 to 16 years old. In total we spoke to and played the game with 262 students this year. Many of these kids would have never had a chance of meeting scientists before. For example, as the Principal of Laura State School told us, their little town currently sits in the lowest 2% of the socio-economic index of Australia. Just like, us, the kids love these visits and so do the teachers. 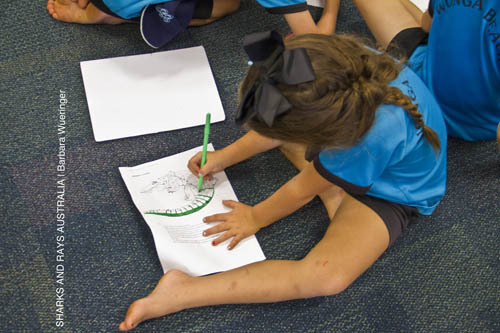 Our school visit to the Normanton State School has led to a collaboration in order to develop materials of the life cycle of the freshwater sawfish. During the first term of 2019, the kids will draw these life history stages. The materials will be available on our page, so stay tuned! This work was supported by the Queensland Government’s Engaging Science Grant, which also allowed us to develop our ‘North Australian Food Web Game’. You can download the game here. It contains colouring in sheets and fun facts of many animals that are found in the rivers of Northern Australia. 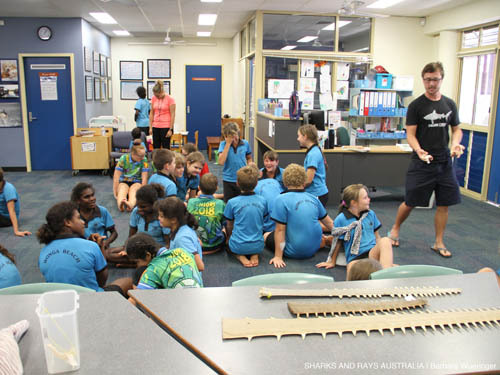 The kids at Wonga Beach State school learn about our research with sharks and rays, including sawfish.